So you’ve come to the conclusion you are struggling with either an under-active thyroid or with adrenal fatigue. But which is it? Your symptoms seem to fit in with both! In this post I will share how you can tell the two apart based on your fertility chart and some other basic symptoms. After reading this, you will know which of the two it is and how you can start your journey (back) to vitality & fertility. 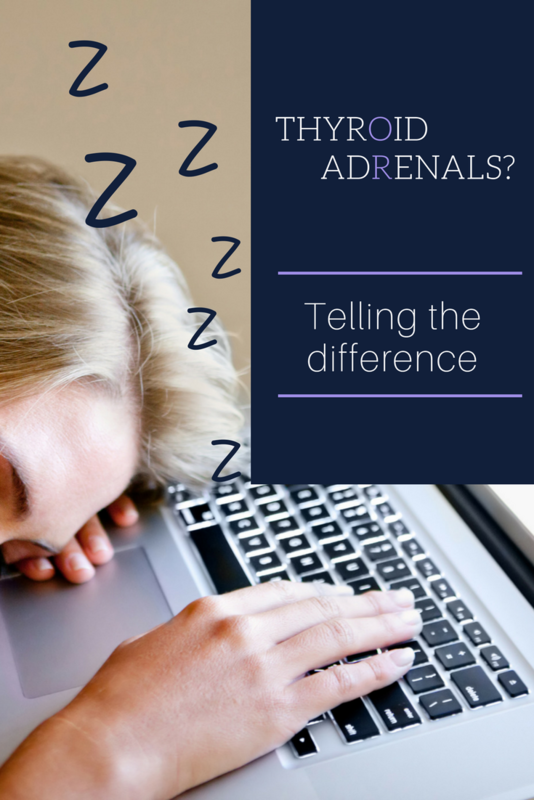 In part 1 of this post, we looked at what adrenal fatigue is exactly and what an under-active thyroid is, and how they can look alike. There are however a few symptoms that make it easy for both you and me to see whether it’s depleted adrenals that are giving you these symptoms, or a slowed down thyroid. Let’s begin with your menstrual cycle. If you are not charting your menstrual cycle yet, this is the time to start. Charting is not just writing in your diary when you have your period though. It also involves making note of your morning temperature, as well as some other symptoms (read more). By tracking several factors, your fertility chart paints you a picture of where you hormonal health is at. For me as a fertility homeopath, charts are the tool for me to identify a patient’s imbalance in hormones like progesterone, estrogen and others, and which hormonal gland is the root issue. That could be the thyroid or adrenals, but also the anterior pituitary gland, ovaries or hypothalamus. 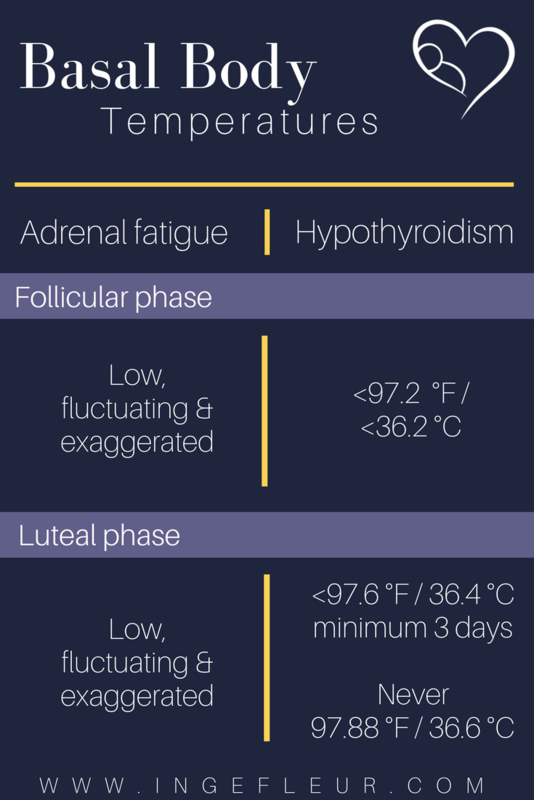 The chart of someone with adrenal fatigue will show basal body temperatures (BBT) that are pretty much all over the place. Often they will be low, but they will fluctuate and be extreme with some highs too. With an under-active thyroid, the BBT’s are pretty steady but overall low. In the follicular phase (from menstruation till ovulation) they are generally under 97.2 F / 36.2 C. In the luteal phase (ovulation till menstruation) they almost never reach 97.9 F / 36.6 C.
Are you charting already and do you suspect you suffering with one or the other but want to know for sure? Share your chart in the private Becoming Vital & Fertile group, tag me in (@ingefleurspreij) and we’ll look at the charts together and see how this may affecting your overall hormonal health and fertility. Homeopathy is a great way to get the hormonal balance back and improving the health of glands. 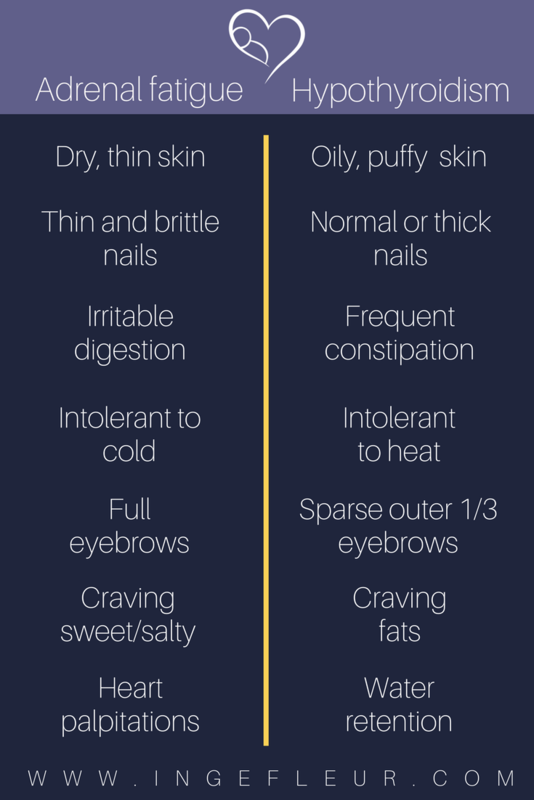 Have a look at these charts of women before having homeopathic treatment and after. Weight gain can be a symptom both for adrenal fatigue and hypothyroidism. However, for adrenal fatigue that is only in the early stage when the body still tries to slow you down. Once adrenal fatigue has become severe, you will not have difficulty losing weight, but likely will have trouble gaining weight. If you are hypothyroid, you will likely feel tired and sluggish all day every day. With adrenal fatigue you also feel tired all day, but can’t fall asleep at night or are waking up during the night. Often that can be the case around 3 am because that is when your liver is most active and will be trying to resolve the toxic stress, or around 5 am which is “hormone” time. Apart from these top three differences, there are a few other typical differences between adrenal fatigue and hypothyroidism. Now, if you are dealing with an under-active thyroid for sure, that may not necessarily mean it is just your thyroid, it may have actually started with your adrenals! When you suffer with chronic stress and your adrenals are constantly firing stress hormones, your body has a very clever trick to help you slow down and rest. It uses the thyroid to slam the breaks and slows it down on purpose (read more)! If you now recognize yourself in the under-active thyroid symptoms, but remember having adrenal fatigue symptoms in the past, then adrenal fatigue probably underlies your hypothyroidism. If you have adrenal fatigue or your hypothyroidism is a result of that, then the solution lies in getting your adrenals back on their feet! even with auto-immune hypothyroidism, taking care of your adrenals is key to prevent worsening of your condition. If after reading these posts you are confirmed in your suspicions of having adrenal fatigue and/or hypothyroidism and you are fed up with always feeling poorly, book in an appointment to start your healing journey today! Knowing first hand what adrenal fatigue is like and how homeopathy can change your world, I’d love to discuss your case and options with you. Ingefleur has helped me in so many ways. I’ve had years of digestive problems (ie. constipation, irritable bowel, gluten sensitivity, slow stomach emptying, etc.) I’m almost 60 and could not remember a time when I had normal digestion. After working with Ingefleur for a few months, I am thrilled with the results. My digestive problems are virtually gone. I was not a big believer in homeopathic medicine, but it has changed my life. I have been able to occasionally add in breads and pastas to my diet. Ingefleur has helped me with my arthritis, liver, thyroid and energy level as well. She has incredible skill in this field and after very detailed analysis, diagnoses the problem very accurately. I can not stress enough, how important it is to find a homeopath like Ingefleur. She’s amazing! !